Bill Smith, Editor: Francois Hollande, the Socialist and Radical Left Party candidate has been elected as the new President of France replacing the more conservative Nicolas Sarkozy. Hollande will become the first Socialist president since Francois Mitterrand stepped down in May 1995. Hollande served as the First Secretary of the French Socialist Party from 1997 to 2008 and as special adviser to the President Mitterrand before serving as a staffer for Max Gallo, the government's spokesman. Most Americans forget or are unaware that France is a nuclear power. Sarkozy and Hallande will meet at the Elysee Palace next Tuesday for the traditional handover of power, They will then have a private meeting where Sarkozy hands over the codes to France's nuclear deterrent. American can expect that left minded President Barack Obama to be back slapping France's President Francois Hollande in short order. While Obama is considered by some to be a "stealth socialist," Hollande is an open socialist. William J. Bennett, CNN Contributor had some interesting thoughts: Last week, President Obama's campaign launched a fictional storybook ad called, "The Life of Julia." 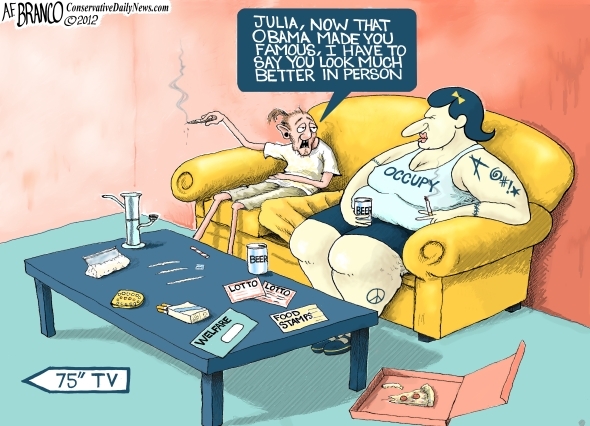 The slide show narrative follows Julia, a cartoon character, from age 3 to age 67 and explains how Obama's policies, from Head Start to Obamacare to mandated contraception coverage to Medicare reform, would provide Julia with a better life than Mitt Romney or Paul Ryan could. At age 31 she "decides to have a child," with no mention of a father or husband. Her son Zachary heads off to a Race to the Top funded public school, while Julia goes on to start her own Web business. She retires at age 67 with Social Security and Medicare supporting her financially and spends her later years volunteering in a community garden. Julia's happily-ever-after tale is remarkably void of reality. Nowhere in her fictional life is it mentioned that Head Start has done little, if anything, to improve elementary education, that she will likely graduate with $25,000 in student loan debt, that she has a 50% chance of being unemployed or underemployed after college, that Medicare and Social Security are headed toward insolvency, and that her share of the national debt is $50,000 and growing. . . . The Life of Julia" . . . -- outline in exacting detail what modern Democratic policy wants for individuals. Here we have Obama's 21st century synthesis of the Great Society, New Deal and New Frontier. Julia's entire life is defined by her interactions with the state. Government is everywhere and each step of her life is tied to a government program. Notably absent in her story is any relationship with a husband, family, church or community, except a "community" garden where she works post-retirement. Instead, the state has taken their place and is her primary relationship. . . . Tags: French Leftovers, France, new president, socialist, Francois Hollande, Obama's Julia, Democrat, socialist agenda, controlling life, cradle to grave To share or post to your site, click on "Post Link". Please mention / link to the ARRA News Service. Thanks! The French election was disappointing, but expected with so many there depending on the state for their livelyhood. When almost 60% of the country is bound at the hip to the State, a state thats wanting to cut back on my entitlements its a uphill battle. France not only has the atomic bomb, but the H-bomb.I remember when they tested in the pacific. 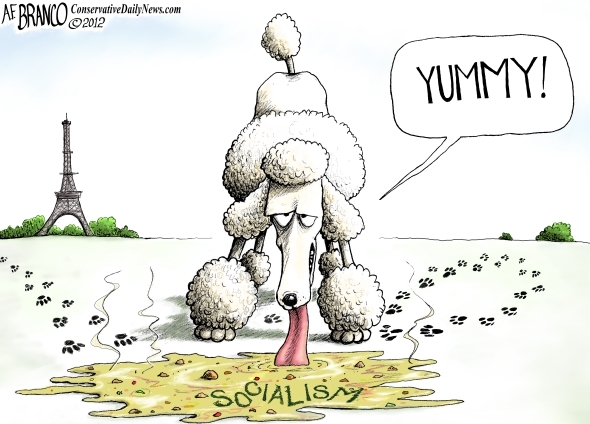 As usual great toons from Tony Branco---I use most of his as well as many from townhall. Recently came across another get site for toons at Out of Order Blog you may want to check it out as Dale does great work.